National Hispanic Heritage Month runs Sept. 15 to Oct. 15. The celebration started as a week under President Lyndon Johnson and then expanded to the present 30-day period under President Ronald Reagan in 1988. It started Sept. 15, the anniversary of independence for Latin American countries Costa Rica, El Salvador, Guatemala, Honduras and Nicaragua. Mexico and Chile celebrate their independence Sept. 16 and Sept. 19. The month is a celebration of the histories, cultures and contributions of those from Spain, Mexico, the Caribbean, and Central and South America. 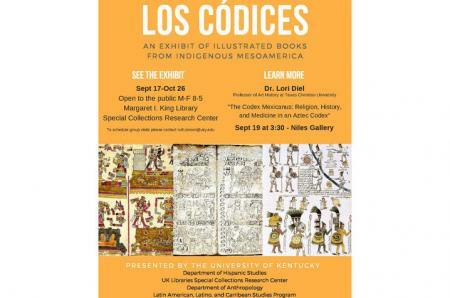 The exhibit will feature 12 full color Mesoamerican códices. The SCRC teaches several classes with these important facsimiles every year. Made possible by a partnership with faculty from the Department of Modern and Classical Languages, Literature and Cultures; Department of Hispanic Studies; Department of Anthropology; and the Latin American, Caribbean and Latino Studies Program, the exhibit was curated by a graduate student from UK's Hispanic Studies program, Jacob Neely, with assistance from SCRC’s Education Archivist Matthew Strandmark and Director of Research Services and Education Jaime Marie Burton. School groups from Lexington and classes from across campus are planning to visit the exhibit while it is on display (by appointment). The public is also welcome to visit the exhibit from 8 a.m. to 5 p.m. Monday through Friday. There will also be a table with worksheets and pencils for visitors to participate in the exhibit by completing an activity. A lecture with Lori Diel, professor of art history from Texas Christian University, will be presented in conjunction with the exhibit 3:30 p.m. Wednesday, Sept. 19, in the Niles Gallery located in the Lucille C. Little Fine Arts Library and Learning Center. 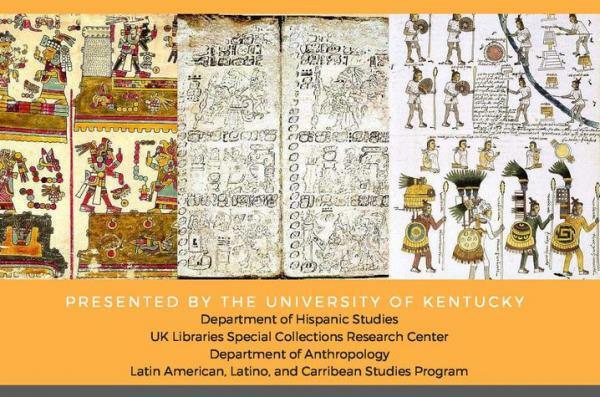 Organized by Ruth Brown, lecturer and academic coordinator in Hispanic Studies, Diel's talk is on "The Codex Mexicanus: Religion, History, and Medicine in an Aztec Codex." Diel is a member of the College Art Association, Association for Latin American Art, American Society for Ethnohistory and Latin American Studies Association. Diel has a bachelor's degree from Emory University and a doctoral degree from Tulane University. She teaches art history at Texas Christian University focusing on art of ancient Americas (Mesoamerica and South America), Mexico and Latin America.